Galvanic Applied Sciences (Calgary, Canada; Massachusetts, US) manufactures online process analysers for industrial gas and liquid applications. Galvanic has over 35 years of experience delivering custom-engineered solutions for oil and gas, petrochemical, and environmental applications. Each analyser is manufactured in Galvanic’s North America factories. Galvanic is partnered in the GCC with Nahj Al Saudia (Al Khobar, Saudi Arabia). Since inception, Nahj Al Saudia has continuously fulfilled its mission of providing integrated "localised" solutions covering a wide range of products and services critical to the oil and gas, petrochemical, electric power, steel, mining, desalination and water treatment industries. 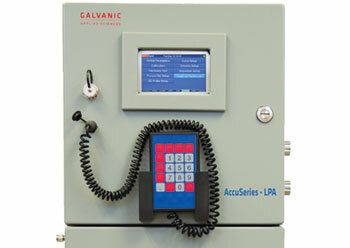 Galvanic’s analyser portfolio makes it a "one-stop-shop" for custom gas and liquid analysers. Gas technology includes gas chromatography, colorimetric tape, spectrophotometry, and chemiluminescence. Liquid technology covers wet-chemistry, UV-VIS photometry, acoustic-backscatter, and viscosity. These analysers are designed for the hot Middle East climate with an upper temperature limit of 60°C. To simplify installation, the analysers are certified for hazardous areas (ATEX, IECEx, NEC) without requiring an air purge. Remote analyser control is facilitated through a secure Ethernet connection. Self-diagnostics alert operators of upset conditions before serious problems occur. Galvanic does not supply "off-the-shelf" analysers. Each system goes through a thorough engineering and chemistry review to ensure the perfect fit for the application. This includes material compatibility, sample conditioning, and method of analysis selection. Analyses are configured to any standard method (EPA, ISO, ASTM) or custom SOP to ensure they match a customer’s laboratory results. Detection limits can be as low as 5 ppb or as high as per cent level. Modular analyser designs and rugged wetted parts minimise maintenance. When maintenance is required, global partnerships with authorised distributors offers local service support with stock of consumables to reduce lead time. Both scheduled and unscheduled maintenance is available from factory-trained service engineers throughout the Middle East. • ProTech903 Tape Analyser: Fastest tape analyser in the world with predictive alarm analysis for over-range detection. Combined H2S & Total Sulphur configurations with extended-life tape. • Brimstone 943 Tail Gas Analyser: Patented "cold-finger" probe design assures no down-time from high-sulphur plugging. Electric oven layout eliminates any worry about steam quality. < 10 second response time to changing process conditions and no offline calibration gas requirements…ever! • AccuSeries-LPA Wet-Chemistry Analyser: Multi-parameter and multi-stream ensures a fast return on investment. Galvanic’s unique advantage is working directly with customers to solve complex process issues. Galvanic welcomes companies to contact Galvanic or Nahj Al Saudia with their operational challenges to see what solutions are possible to improve their process control. Implementing Galvanic’s online monitoring technology for key performance indicating parameters helps companies significantly reduce costs and increase profits. They will avoid expensive process upsets, high raw material usage, and falling out of environmental compliance.